This species seldom if ever resorts to the Southern States during winter, and to the westward of the Alleghany mountains scarcely proceeds farther down the Ohio than the neighbourhood of Louisville in Kentucky; so that it may be considered as quite a northern bird. It reaches Massachusetts at the approach of winter, and is more frequent in the maritime districts of that State than in the interior, where, however, it is met with in considerable numbers. In the beginning of October, if the weather be cold, the Tree Sparrow is seen among the magnificent elm trees that ornament the beautiful city of Boston and its neighbouring villages; and, like the hardy, industrious, and enterprising people among whom it seems to spend the severe season by choice, it makes strenuous efforts to supply itself with the means of subsistence. Many remove as far south as Pennsylvania, and even Maryland; but I never observed one in either of the Carolinas. Their return to the north is marked by a lingering disposition to wait each day for a finer and warmer morrow. They appear, indeed, so perfectly aware of the danger to be encountered during a forced march in the early spring, that on the least change from mild weather to cold, they immediately return to their loved winter quarters. By the middle of May, however, they have begun to move regularly, and their songs announce the milder season at every resting place at which they tarry. The Tree Sparrow sings sweetly during the love season. I have frequently listened to their musical festivals near Eastport, in the State of Maine, while gazing upon them with an ardent desire to follow them in their progress northward. Twenty or more, perched on the same tree, often delighted me with their choruses, now and then varied with the still clearer notes of one or two White-throated Finches, that, like leaders of an orchestra, seemed to mark time for the woodland choristers. Toward the close of the day their single notes were often repeated, and sounded like those of a retreat. They seemed to hop and dance about among the branches, mixing with the "White-throats," and enjoying a general conversation, when the pipings of two or three frogs would suspend their entertainment. At early dawn they were all on the alert, and if the rising sun announced a fine day, group after group would ascend in the air, and, with joyful feelings, immediately proceed towards their breeding-places in the distant north. I followed them as far as the Magdeleine Isles, saw some in Newfoundland, and all the countries between it and Maine, but did not find a single individual in Labrador. On the islands above mentioned I saw them arriving in flocks of from five to a dozen, flying widely apart. They dived towards the ground, and at once threw themselves among the thickest coverts of the tangled groves, where, although I could hear their single chip, I could seldom see them afterwards. Their flight is more elegant and elevated than that of most of our Sparrows, and they pass through the air in rapid undulations, more regular and continued than those of any other bird of the family, except the Fox-coloured Sparrow. On opening several of these birds, I found their stomach to contain very minute shell-fish, the remains of coleopterous insects, some hard seeds, small berries, and grains of sand. Many of the Tree Sparrows breed in New Brunswick, in Nova Scotia, and, I have reasons for believing, in the northern portions of the State of Maine. A nest given me by Professor MACCULLOCH had been found a few feet from the ground, on the horizontal branch of a fir tree, not far from the stem. It was principally formed of rough grass, and lined with fibrous roots, hairs of various quadrupeds, and some from the horse. It contained five eggs, of a uniform deep blue, so closely resembling those of the Common Chipping Sparrow, that, had they not been much larger, I might have concluded them to be those of that bird. I suspect that, in a country where the summer is so short, the Tree Sparrow seldom if ever breeds more than once in the season. When we returned to the United States late in August, the Tree Sparrows with their young were already moving southward. A mere intimation of the rich chestnut colour of the head of the adult in summer was seen. They had already tuned their pipes, which sounded in my ear as their affectionate farewell to a country, where these sweet little creatures had met with all of happiness that their nature could desire. 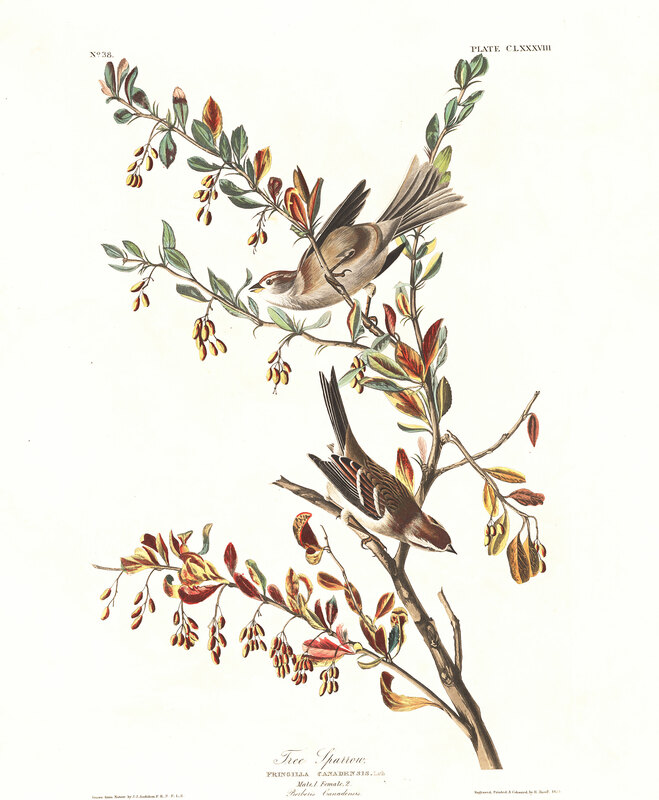 The pair represented in the plate, and which have been placed on a twig of the barberry bush, were procured at Boston. The drawing from which it has been copied was made by my youngest son. According to Dr. T. M. BREWER, this is the most common Sparrow found near Boston during the winter, inhabiting in large flocks the low bushes and grass in marshy, sheltered situations, much of the time very quiet and inactive. A specimen sent by him in spirits has the palate ascending obliquely, and of the usual appearance, the upper mandible beneath with a middle prominent line and two broad ridges, which at the base form a hard flattened prominence, similar to that of the true Bunting, but not so elevated. Tongue 4 1/4 twelfths long, about as deep as broad, fleshy and convex at the base above, channelled toward the end, which is pointed and horny. Width of mouth 3 1/2 twelfths. OEsophagus 2 inches 1 twelfth long, dilated on the middle of the neck into a large crop, 5 twelfths in width, which winds round into the hollow of the neck behind. Stomach roundish, placed obliquely, 6 twelfths long, 7 1/2 twelfths broad; its lateral muscles very large, as are the tendons; the epithelium dense and longitudinally rugous. The stomach filled with seeds and sand, and the crop partially filled with the former. The intestine is 7 inches long, from 2 twelfths to 1 twelfth in width; the coeca 2 twelfths long, 1/4 twelfth width, 10 twelfths from the extremity. The trachea is 1 inch 8 twelfths long, nearly 1 twelfth in breadth; its rings 75, firm and considerably flattened. Inferior laryngeal muscles small. Bronchi of about 12 half rings. Rarely reaches the Carolinas during winter, or Louisville on the Ohio. Breeds from Maine northward to the Fur Countries. Abundant. Migratory. TREE SPARROW, Fringilla arborea, Wils. Amer. Orn., vol. ii. p. 12. FRINGILLA CANADENSIS, Bonap. Syn., p. 109. EMBERIZA CANADENSIS, Tree Bunting, Swains. & Rich. F. Bor. Amer., vol. ii.p. 252. TREE SPARROW, Fringilla canadensis, Nutt. Man., vol. i. p. 495. TREE SPARROW, Fringilla canadensis, Aud. Orn. Biog., vol. ii. p. 511;vol. v. p. 504. Bill short, strong, conical, acute; upper mandible rather narrower than the lower, with the dorsal outline very slightly convex, the sides rounded, the edges sharp and inflected, the tip very slightly declinate; lower mandible also slightly convex in its dorsal line, the sides rounded, the edges involute; the gap-line slightly deflected at the base. Nostrils basal, roundish, concealed by the feathers. The general form rather robust. Legs of moderate length, slender; tarsus compressed, anteriorly covered with a few long scutella, sharp behind; toes scutellate above, free, the lateral ones nearly equal; claws slender, slightly arched, that of the hind-toe considerably larger, much compressed, acute. Plumage soft, blended. Wings of moderate length; the third and fourth quills longest and equal, but the second, third, fourth, and fifth are about the same length, and slightly cut out on the outer edge; secondaries emarginate. Tail long, emarginate, nearly straight, of twelve rather narrow, obliquely pointed feathers. Bill black above, reddish-yellow beneath, with the tip blackish. Iris brown. Legs dusky brown, the toes blackish-brown. Upper part of the head bright bay; a band of greyish-white passes over the eye, lighter at its commencement near the upper mandible, and gradually shaded into ash-grey; sides of the head and neck ash-grey, the latter with some streaks of bay, of which a short band proceeds from the eye backwards. Middle of the back streaked with deep brown, bay, and pale yellowish-grey; rump light yellowish-grey. Wing-coverts similar to the back, the first row of small coverts and the secondary coverts broadly edged with bright bay and largely tipped with white, of which there are thus two conspicuous bands across the wing; quills dusky, the outer margined with dull white, the inner with pale bay, the three inner secondaries broadly margined towards the end with white. Tail-feathers also dusky, margined externally and internally with greyish-white, the edge of the outermost pure white. Fore-neck pale grey, the sides yellowish-grey, the breast and abdomen white, tinged with cream-colour, the under tail-coverts white. An obscure spot of dark brown on the middle of the breast; and the feathers that cover the flexure of the wing, when closed, are bay. Length 6 1/4 inches, extent of wings 8 3/4; bill along the back 4/12, along the edge 6/12; tarsus 10/12. The female resembles the male, but is paler in its tints, and rather smaller. BERBERIS CANADENSIS, Willd., Sp. Pl., vol. ii. p. 227. Pursch, Fl. Amer. Sept., vol. i. p. 219.--HEXANDRIA MONOGYNIA, Linn.--BERBERIDES, Juss. This species of barberry is very abundant in Maine and Massachusetts, as well as in the British provinces. It is an erect shrub, from five to eight feet in height, with triple prickles, simple obovate remotely serrated leaves, short corymbose racemes; yellow flowers, and pendulous oblong red berries, having an agreeable acid taste.